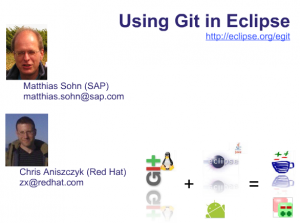 Today in scenic Ludwigsburg, Matthias Sohn and I gave a presentation at Eclipse Summit Europe 2010 on using Git in Eclipse. As part of the presentation, we discussed what’s upcoming in the EGit/JGit 0.10 releases and demoed a new merge tool that is coming to EGit (from the latest nightly build). After demoing, we also discussed how the code review tool Gerrit works and how we effectively use it within our projects. Also, it was nice to see that 1/3 of the audience was using Git already either at work or for side projects. If you want to help with the Git effort at Eclipse, please try our nightly builds, file bugs and contribute!